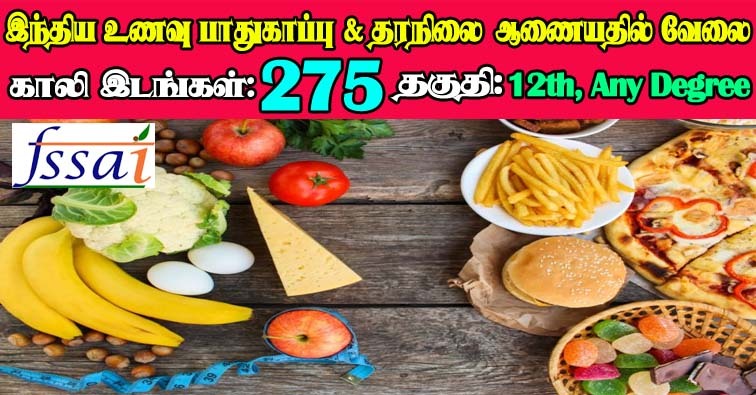 FSSAI Recruitment 2019 - FSSAI invites Online applications for recruitment of 275 Assistant Director, Central Food Safety Officer, Administrative Officer, Assistant, Junior Assistant, Personal Assistant Posts. This online facility will be available in the Official website fssai.gov.in from 26.03.2019 to 25.04.2019 (Till 11:59.00 PM). Prospective candidates will have to apply online after carefully reading the detailed advertisement regarding the process of examination, eligibility criteria, online registration processes, application fee/ intimation charges, pattern of examination, Syllabus, How to Apply, Question Paper, issuance of admit cards/call letters, Exam Date, Result Date etc. and ensure that they fulfill the stipulated criteria and follow the prescribed processes. (ii). Five Years relevant experience. “Master Degree from a recognized University or Institution in Chemistry or Biochemistry or Food Technology or Food Science & Technology or Food & Nutrition or Edible Oil Technology or Microbiology or Dairy Technology or Agricultural or horticultural Sciences or Industrial Microbiology or Toxicology or Public Health or Life Science or Biotechnology or Fruit & Vegetable Technology or Food Safety & Quality Assurance. Bachelor’s Degree from a recognised University or Institution; and three years’ experience in handling administration, finance, human resource development or/ and vigilance and accounts matters. Desirable: Master degree or MBA ( Personnel or Human Resource Management or Finance) or CA or CS or ICWA from a recognized university or Institution. Bachelor’s Degree from a recognised University or Institution. Bachelor’s Degree from a recognised University or Institution with proficiency in shorthand (80 WPM) and typing (40 WPM - English) and/ or (35 WPM Hindi) (ii) Should be computer literate and proficient in using MS Office and internet etc. (i)B. Tech or M. Tech in Computer Science or any other relevant Engineering Discipline or MCA or Bachelor’s Degree in Relevant field. Bachelor’s Degree with atleast one year PG Diploma/Degree in Computer Application or Information Technology or equivalent degree in relevant field. FSSAI may follow the following process to select the candidates.